As mentioned on meta.stackexchange.com several months ago, all network sites will be getting updated themes. 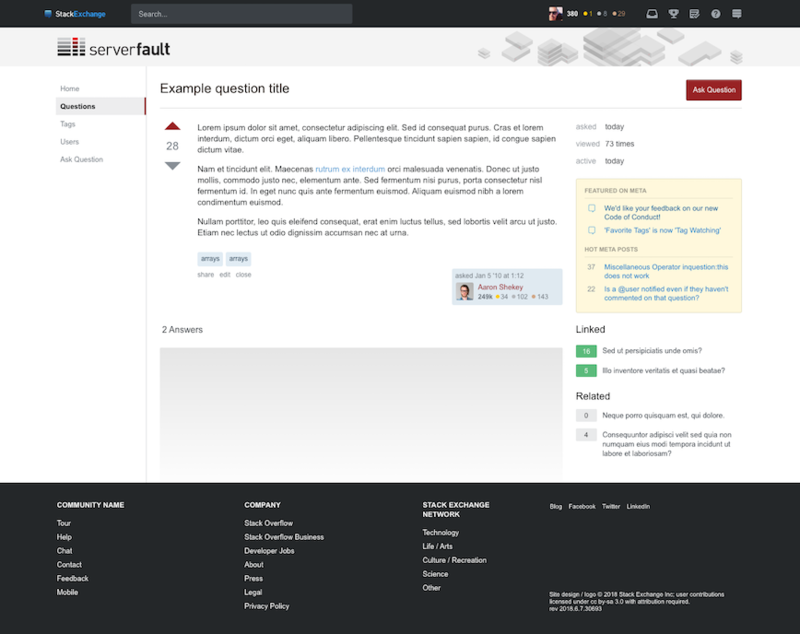 Server Fault is one of the first sites that will be updated. As such, I'm posting the design here so you can see how the new theming will be applied to your site. I want to acknowledge that this will be a painful change for sites that have rich, custom themes. I want to reinforce that the theme changes are a required step to deliver ongoing value to the sites with as little friction as possible. We released changes for tag watching (aka favorite tags) this week and will be releasing a beta of custom question list functionality soon. The only way to make sure Q&A improvements are quickly available to all Q&A sites is to fix our themes. Every Q&A site has its own theme. But there is great inequality in the level of theming that we support. A few (~10) get Cadillac treatment, some (<50) are more like a Honda, while most (~100) are a Yugo. The reality is we created a theming system that we didn't have the design resources to fully support, thus the inequity. In addition, as currently defined, our theming gets in the way of releasing new features on the sites. In order to deliver the left nav, responsive design and future improvements to all sites we've created a more standardized way to support theming. This will reduce the burden of supporting designs as we make Q&A improvements. The result is that most sites will see an improvement in the level of theming that they can get. While some sites will see a reduction. All of Q&A (Enterprise, Teams, etc) will standardize on this new theming scheme. Please review the mockups and feel free to provide constructive feedback in answers below. We aren't going to revisit the choices we've made around simplification, so it would be more productive to keep feedback focused on the application of the new theme scheme. Note: I'm leaving on vacation later today, but didn't want to delay getting these designs posted. As such, I'll have limited time/ability to respond to feedback and comments until I return. You can click on the mockups below to see the image in a larger format. I believe this 3 column design with a largely empty and unused first column is a massive waste of space, especially on technical sites that often use wide code segments that then needs to be sidescrolled to be fully read. Everything that's in there should be where it is now or in a burger menu (this appears to only happen on very narrow displays on SO). But I am certain this has been mentioned and ignored before... (Edit: I've seen it will have at least a workaround in form of a preference. This should be the default to make the site more useful to anon visitors and casual users). 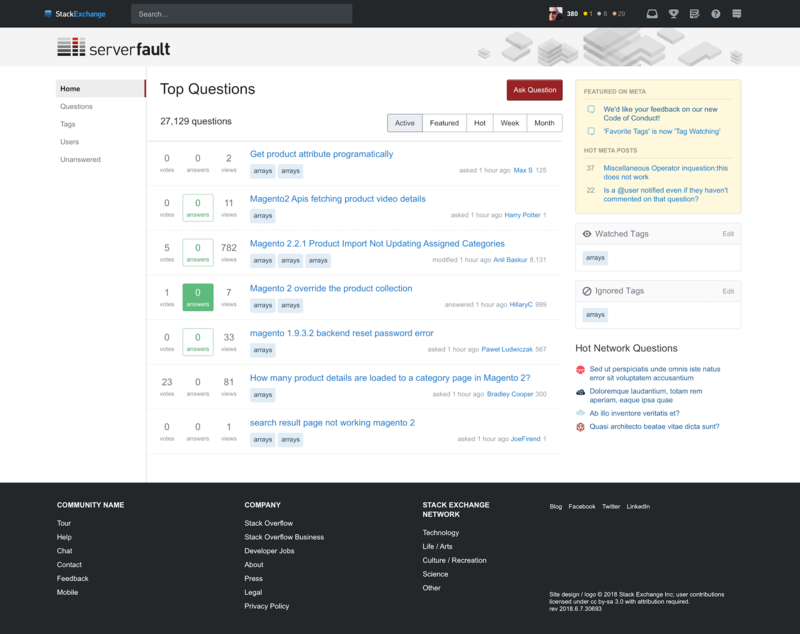 I'am happy to see the new theme coming to serverfault with the ability to watch tag. One feature that was lacking the old theme was the way the site show a question with a accepted answer, from all the view (the box with the number of answer or the box in the profile's view with your answer). So I'am happy to see a theme more easy to read with those green box, like all other SE's site.